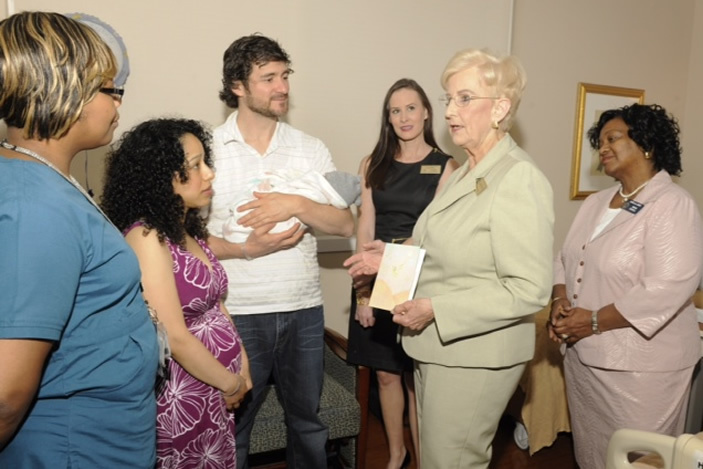 First Lady Sandra Deal speaks with new parents Patricia and Patricio at Emory University Hospital Midtown about the importance of infant immunizations as others listen. 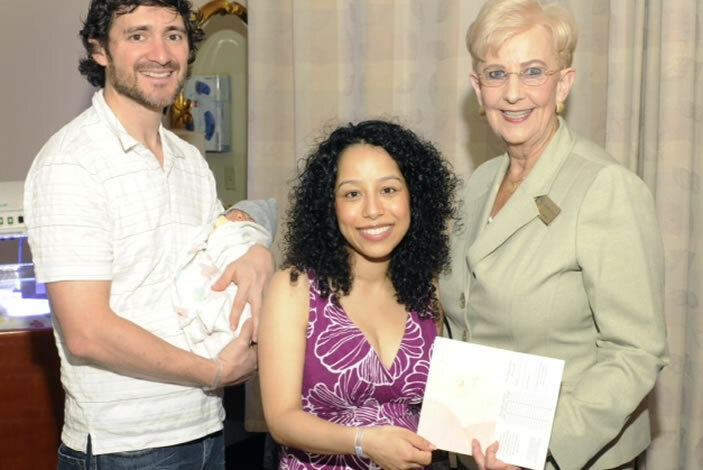 New parents Patricio (left) and Patricia (middle) show off their greeting card and immunization record given to them by First Lady Deal at Emory University Hospital Midtown. The immunization record will help when vaccinating baby Alejandro. 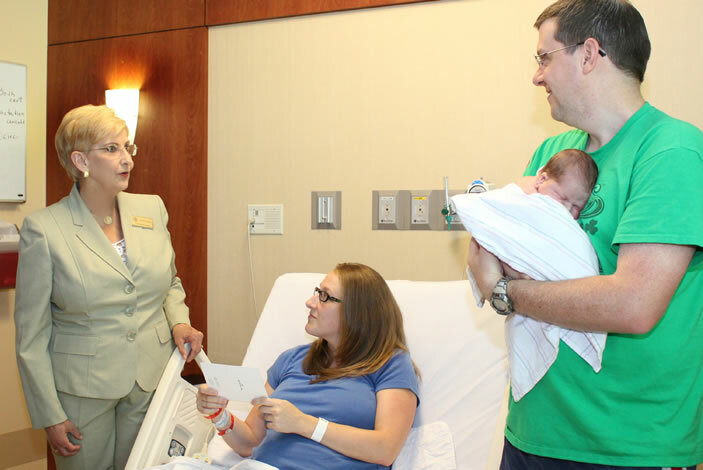 At Emory Johns Creek Hospital, the First Lady offers congratulations to parents Rebecca and Billy on the birth of their son, Everett. She tells them about the new initiative, which encourages newborn vaccinations. Hospital leaders at Emory Johns Creek Hospital tour First Lady Deal through the Birth Place, as she visits local hospitals promoting childhood immunizations. Georgia's First Lady Sandra Deal visited two Emory hospitals on Thurs., July 17, to speak with new mothers and fathers about the importance of immunizing their newborn babies. The Georgia Children's Cabinet, of which the First Lady is chair, initiated this lifesaving project to raise awareness of newborn vaccinations and reduce the number of infant deaths in the state. The group is spreading the word to Georgians by distributing greeting cards with detachable immunization records to new parents at local hospitals. The project is aimed at protecting the health of infants and ensuring all Georgia babies will be given an opportunity for a safe and healthy life. First Lady Deal visited with new mother and father, Patricia and Patricio, at Emory University Hospital Midtown, welcomed their new baby and handed out a greeting card and immunization record to them. She talked about the why immunizations are so important for their new baby boy, Alejandro. Later in the day, the First Lady visited Emory Johns Creek Hospital where she congratulated new parents Rebecca and Billy on the birth of their new baby boy, Everett. First Lady Deal encouraged childhood immunizations as a way to protect the health of our youngest citizens. 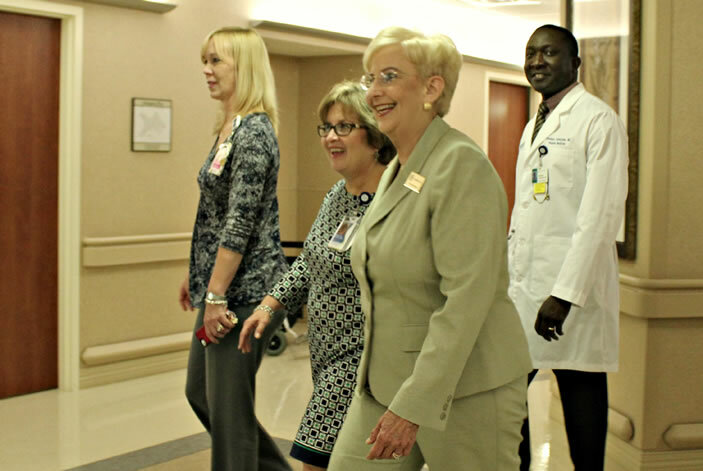 Hospital leaders were thrilled to have First Lady Deal visit both locations, its patients and staff. The greeting cards feature a congratulatory message from Governor Deal and Mrs. Deal and include a growth chart as well as immunization chart, to help new parents remember all the immunizations required before babies are even two months old. The list of immunizations shown on the card is recommended by the American Academy of Pediatrics, the American Academy of Family Physicians, and the Centers for Disease Control and Prevention's Advisory Committee on Immunization Practices.